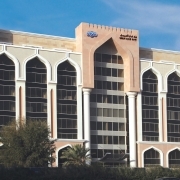 Muscat, January 13, 2019: In line with its objective of encouraging the habit of saving amongst its customers, Oman Arab Bank (OAB), has announced the launch of its new ‘Hasaad’ Savings Scheme for 2019. The new scheme has been designed to offer customers increased chances of winning across all the Bank’s branches, as part of the monthly branch draws. Others include monthly draws for Elite and new monthly draws for Youth and Children’s account holders, to encourage savings amongst the younger generation. In addition, the new savings scheme will also include to major quarterly prize draws. Muscat, January 06, 2018: Oman Arab Bank (OAB) will kick off 2019 with the launch of a host of new customer centric innovations as part of its ongoing digital transformation journey. It will do so at a press conference, which will be held later today, where it will also showcase its Next Gen ATMs and series of innovative digital solutions. The press launch was presided over by the Bank’s CEO, Rashad Al Musafir, and accompanied by a number of executive members of the Bank’s Management and will include a live demonstration of the capabilities of the Next Gen ATMs. OAB launched its transformation strategy a few years back with the ultimate aim of becoming the Bank of choice for customers in Oman. It has since continued to stay at the forefront of the Banking sector paving the way for the future with the launch of several new innovative digital banking solutions. 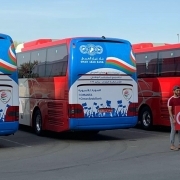 Muscat, January 10, 2019: Oman Arab Bank (OAB), in line with its objective to support the community and national sports initiatives and teams, has arranged for three buses to take over 150 fans to support the Omani National Team in the upcoming group stage matches in the UAE as part of the AFC Asian Cup. This initiative was launched in collaboration with the Oman Football Associations (OFA), through whom fans were required to book their spaces. As part of its sponsorship, OAB has made arrangements for three buses to take over 150 fans for each of the three upcoming group stage matches that the National Team will be participating in as part of the AFC Asian Cup. All bookings were taken on a first come, first served basis through OFA. The first of three matches took place yesterday against Uzbekistan in the Al-Sharjah Stadium. The next trip will be In support of the National Team’s match against Japan on January 13 in the Zayed Sports City Stadium, Abu Dhabi. The last of the three group stage matches will be against Turkmenistan on January 17, taking place at the Mohammed bin Zayed Stadium, Abu Dhabi. “Each of these teams is extremely talented but I am confident the Oman National Team has what it takes to come out on top. On behalf of OAB, I would like to wish each of the players the very best of luck in their upcoming matches,” added Hilal Al Siyabi. 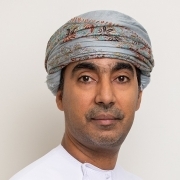 Muscat, 10 February 2019: In recognition of the importance of SMEs to the growth of the economy, Jamal Al-Wahaibi, the Head of the SME Department at Oman Arab Bank, recently participated in a panel at an MSME forum titled ‘Governance for Sustainable Growth: Enhancing MSME Outcomes’. 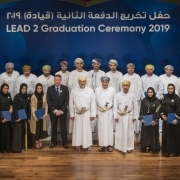 The event was organised by The Pearl Initiative and Zubair SEC on Wednesday, 06 February 2019 at the Zafran Cafe, Bait al Zubair Museum. The event, which was attended by over 100 budding entrepreneurs and aspiring business owners from across the country, was focused on finding out why corporate governance matters to small businesses seeking funding, and what MSMEs can do to incorporate best practices in corporate governance for sustainable growth. The event included a comprehensive introduction to Corporate Governance and a panel discussion with the participation of Jamal Al-Wahaibi representing OAB as a speaker. The panel was focused on how corporate governance capabilities will benefit the MSME community, and what steps MSMEs can take to incorporate tailored governance structures to ensure their business potential and longevity is achieved. It covered three primary topics – How to raise funding successfully, How to manage time and effort to be efficient, nimble, and innovative, and How to attract and retain talent. “In addition to helping us offer them advice and assistance, forums such as these offer the perfect opportunity to interact in person with budding entrepreneurs and get a better understanding of the products and services they are looking for. This in turn helps us tailor our products to better cater to their financial needs,” concluded Jamal.